An okay martial arts movie about an underground, illegal ultimate fighting tournament. Bloodsport is a pretty average movie. It’s all about this secret tournament in Hong Kong, and the movie tries to divert our attention from that tournament as much as possible. It does this by including all kinds of other storylines, including that of two FBI agents who are trying to take our protagonist, Frank Dux (Jean Claude Van Damme,) in, and a romance that springs up when Dux steps in to challenge two guys who are trying to have their way with a reporter. The different challenges that happen in the middle of the film, including training exercises and brick breaking, are fun. The actual fighting in the tournament is nothing special and uses way too much slow motion. Bloodsport is an okay fighting movie. It’s a film about an illegal underground tournament, starring Jean Claude Van Damme, and it’s really the actor’s very first notable film. After this there was Kick Boxer, just one year later, and then a series of movies that led Van Damme into his period of mass success. Those movies that paved the way, included things like Double Impact and Universal Soldier. It wasn’t until Van Damme teamed up with Hong Kong action director John Woo to make Hard Target that Van Damme suddenly found a place on the radar of popularity. That movie led to Timecop, Street Fighter, and Sudden Death. All in the course of three years, from 1993 to 1995. By the time those three years were over, Van Damme was on his way out of the system, having been chewed up and spit out. Still, he did have those three years and those four movies, (including Hard Target.) 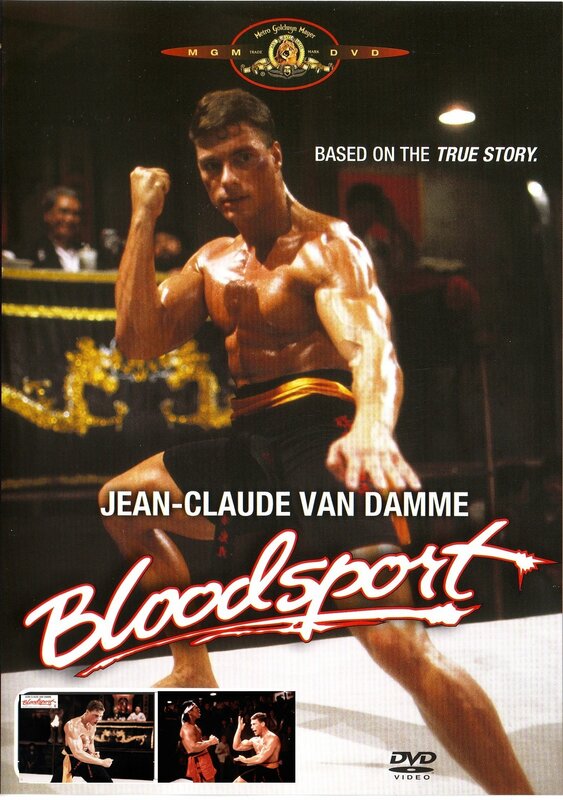 With Bloodsport, you can see Van Damme at his youngest, and perhaps in his very best shape, and see the potential he had to become an action star. 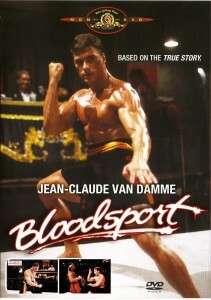 The movie is about the tournament as much as it is about the Van Damme character, Frank Dux. At the start of the film, we get a montage of people around the world training for the tournament in all different ways. One guy in Africa, for example, climbs a tree and knocks as many coconuts off a brance as he possibly can at rapid speed. All of this is set to fast, loud 80s music. In fact, many other scenes in the movie are also set to this kind of music, making the action montages often feel like they are out of a Rocky film (Rocky IV.) I imagine that’s what the producers of this movie were going for. Now we head to a military base and meet Dux for the first time. 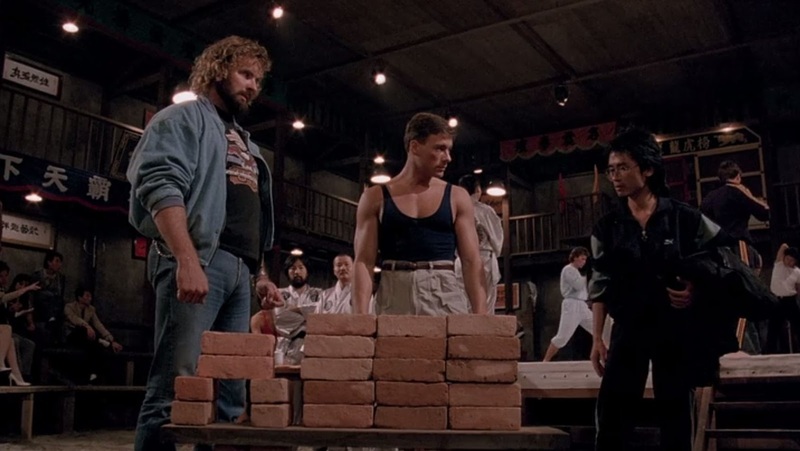 He is approached by another officer on the base who says that the head General just got word that Dux is planning to go over to Hong Kong for this fighting tournament, known as the Kumite. The General wants to speak with Dux about this. Dux asks if he can just take a shower first, and that’s where he sneaks off, leaving the man who was sent to get him staring at an empty shower room with the water still running. All of this establishes Dux as rebellious, sneaky, and even kind of funny. We now see a flashback to what he was like as a child. Dux fell in with the wrong crowd of boys who were breaking into the house of an elderly karate master who kept a samurai sword on display. The boys dared Dux to come along with them, and got inside the house. They even get the sword. But then, when they heard someone coming, the boys dropped the sword and ran off. Dux did not. He stayed and met Tanaka, the karate master who owned the house. This man became his instructor. We see Dux train as a child, alongside the son of Tanaka. We see him have difficulty with the way that Tanaka is training him. And then we cut to present day, where Dux is still close with Tanaka and tells him of his plans to go to Hong Kong and fight in the tournament. Tanaka takes up training Dux, once again, this time as an adult. Some of this training includes fighting blindfolded. There’s even a great moment where Dux has to serve and eat dinner while wearing a blindfold and Tanaka assumes that Dux has let down his guard and attempts to strike him. After his training is complete, Dux goes to Hong Kong for the tournament. I love that this movie really is filmed in Hong Kong, on the city streets there. It’s in this city that Dux finds himself pursued by two American FBI agents. One of these is played by Forest Whitaker. The two agents have been filled in on the situation by the military and have been sent overseas to bring Dux back. They contact local law enforcement, hoping to get some help with catching their man. Dux meets another American, named Ray, while at the hotel one night. The two of them bond over a karate arcade game and become instant friends. Ray is even more of a rebel than Dux, and doesn’t hesitate to do things that he feels in the moment, without thinking them through. This includes calling out the Chong Li, the man who won the tournament the year before, after Ray defeats an opponent. This is meant to make Chong Li mad, and it works. Another character who Dux meets is Janice, a reporter who is trying to get a scoop on the tournament, and having a very difficult time of it. Nobody will talk to her, since the tournament is meant to be secretive. Two men tell her that they are taking her to their room, regardless of whether or not she wants to go. Dux steps in to stop them. There’s a rule to the tournament that if anyone is caught fighting outside of the tournament, they will automatically be disqualified. Knowing that, Dux proposes another idea for how to handle these guys and come to an arrangement on who should get the girl. He challenges them to an interesting coin bet, and wins. This sets up the romance between Dux and Janice. All of this is more interesting than the tournament itself. The fighting in the tournament is just okay. Far better are the individual challenges that lead up to the tournament, such as that coin bet. Another one comes when the people running the tournament don’t believe that Dux represents Tanaka and give him a challenge to prove it. 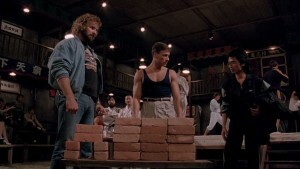 A bunch of bricks are set up on top of each other and Dux is told that he needs to break only one brick. The bottom one. That means none of the other bricks can break in the process. It’s a cool challenge, and he pulls it off. If only the fighting were better, this could have been a pretty cool movie. The villain is definitely presented as evil, with Chong Li often getting opponents to the point where they are about to pass out, and where he has already one, and then delivering still another very harmful blow. At one point this blow breaks a man’s leg. At another, he nearly kills a guy. But when it comes to the actual fighting, this movie constantly reverts to slow motion and having guys jump over each other. Van Damme does splits and kicks, and it’s all fine, but nothing that impressive compared to someone like Jet Li. At the end of the day, it’s just a guy high kicking his opponents. One would hope for a little more.